Magic Flight Launch Box Review - A Simple, Well Designed Box! 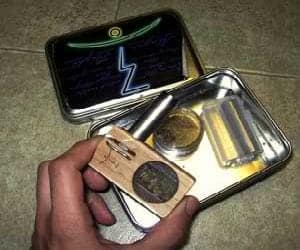 Home → Vaporizers → Magic Flight Launch Box Reviewed – Simplicity At It’s Best! Magic Flight Launch Box Reviewed – Simplicity At It’s Best! The world of vaporizers is one that seems to be growing and expanding with each and every day that goes by, and this creates for a lot of different things. More people are joining the vaping community, more e-liquid flavors are being made, and there’s a much wider selection of vaporizers that you can purchase. All of this is great, but that last one can prove to be a bit of a doozy at times. Having lots of choice when it comes to your vaporizer is great, but deciding which one is best for you can often prove to be a bit of a challenge. In my Magic Flight Launch Box vaporizer review, I’ll be talking about a vape that doesn’t look like anything else that you can currently buy. This vaporizer undoubtedly has one of the most unique designs that you can find, and along with this, it’s also a really great product all around. Just what makes this such an awesome purchase though? Keep reading my Magic Launch Box review to find out! Upon first glance of the Magic Flight Launch Box, it doesn’t take long at all to see just how different this thing really does look from pretty much every other vape that’s currently on the market. The MFLB’s wooden design both looks and feels fantastic, and in addition to this, the vaporizer offers great battery life and flavor at an affordable price. I had a lot of fun working on the Magic Launch Flight Box review, and here’s a detailed explanation as to why. As soon as I started my Magic Flight Launch Box review, something I noticed right away was the design of this vaporizer. The MFLB looks unlike pretty much any other vape you’ll currently find available for purchase, and this all thanks to the gadget’s wooden design. We usually see companies opt for plastic, metal, or glass as the primary material when creating vaporizers, but you won’t find me complaining about the wood construction here at all. The MFLB is definitely a head-turner, and it’s bound to create for a bit of attention while using it. And, on top of all that, it just feels great to have such a different texture to hold onto as opposed to the slick and cool feel of plastic and metal. Along with the impressive design, looks aren’t the only thing that benefited from this craftsmanship. The Magic Flight Launch Box is an incredibly reliable vape, and it functions like a vaporizer that will easily be able to last you a good few years of solid use (assuming that you take proper care of it of course). If for some reason the MFLB does start having problems, the return/replacement policy that it comes with is incredibly generous and forgiving, and the customer support that you gain access to by purchasing this product is some of the best you’ll find for a vape like this. Those may not be huge concerns for some people, but if you consider your vapes as an investment rather than a simple purchase, these are great things to have for sure. The Magic Flight Launch Box is a vaporizer that uses herbs as opposed to an e-liquid, and while there’s nothing wrong with herbs on their own, something that certain vapes have a hard time with is making effective use of all the herbs that you use. I’ve handled and reviewed plenty of vaporizers that don’t use all of the herbs you include, but this isn’t any issue at all with the MFLB. While this is a dead-simple, barebones vaporizer (more on that in just a bit), something I noticed while starting my Magic Flight Launch Box portable vaporizer review was just how tricky it was to get started with using it at first. The unique design that’s being used also creates for a somewhat challenging use experience from the get-go. For starters, you’ll need to crush up and grind your herbs manually before placing them in the MFLB. Along with this, you’ll want to ensure that you use very slow and steady sucking motions rather than fast ones. Additionally, ensuring that you’re occasionally flipping the bowl of the vape back will help keep all of your herbs are being used properly. There are definitely a few extra steps and tips you need to be aware of with the Magic Flight Launch box as opposed to other vapes, and while it is as bit tricky at first, it’s incredibly easy to operate once you get the hang of things. When talking about the Magic Flight Launch Box, you absolutely have to mention just how minimalistic this vape is. I’ve used plenty of vapes in the past that didn’t have a whole lot of extra features, but with the MFLB, there are pretty much no extra settings to toy and mess around with. There are a couple different ways to look at this. On one side, the lack of controls could be seen as a huge downside if you’re someone that likes to tweak your vaping experience as much as possible. On the other hand, the lack of extra controls makes the MFLB one of the easiest and simplest vapes to use, and for someone looking for a no-thrills vaporizer, this is bound to please quite a bit. With all of that said and done, it should be quite easy to see that there’s a whole lot to like after reading through my Magic Flight Launch Box review. This isn’t a vape for folks looking for lots of extra features, but rather a vape that’s been made for people who want as simple of an experience as possible. The wooden design looks great, the reliability factor is extremely high, and the MFLB is dead-simple to use. If you’re a simple person, this is the vape for you.